Foundation of the Gaels is a course on Udemy given by Tyler Hackworth, historian and storyteller, who has a B.A. in History, a Certificate of Celtic Studies, and a M.A. in Cultural Heritage and Museum Studies. The course is divided into two parts, the first was the ancient Celts and the second was the Celts in the Classical World. All in all there was 13 small lectures, 4 – 7 minutes long, an Introduction video and 2 simple quizzes that check your knowledge of the videos. The lecturer provided a PDF file containing a bibliography and further reading. The first section had some retellings of Irish myths and a little bit of history. The second section had a very general history of the Celts in the continent and in Britain and their interactions with the Romans, Greeks and the rest of the world. I think the lecturer fell into some pit falls when he was taking about the history of the Celts which many other scholars fell into in the 1980-1990s, for example; the massive Celtic migrations, which archaeology has not found a lot of evidence for. I also have a few problems with his interpretation of the Irish myths when it comes to Cú Chulainn but then I have these with a lot of people including some of my friends. Another problem I had, which is my own learning preference and not the lecturers fault, is that it was the lecturer standing there and basically talking. I’m a visual person and I like to have something to read or look at. I found myself zoning out sometimes even though the lectures were pretty short. If he had had maps up there or some bullet points to look at while he was talking I probably would not have zoned out. The file containing the bibliography and further reading books contained a lot of good books but they were also a bit old for the most part. Some of them are from Osprey which mostly caters to the re-enactment crowd. They are good books with some good scholarship behind them but they are very simplistic. I’d give this course a 3.5/5 and wouldn’t recommend it to people with advanced knowledge or ones who want a full historical picture. I would recommend it to people who are interested in a general idea of the beginnings of the Celts but ask that they supplement it with a history book. I’m going to do something different today. I’ve reviewed books and websites before but this is the first time I review a study course. The course is on the website Udemy The course is called Ancient Ireland: Culture and Society by Kevin Flanagan. Kevin Flanagan owns the website The Brehon Law Academy. The course is self-paced so you can take it in your own time. I’m going to start with what I didn’t like to get it out of the way. I was hoping for a further reading file on every lecture or a big one at the end but there wasn’t one. I was also hoping for a bibliography or a works cited file but there wasn’t one either. A lot of the time I wasn’t sure where his information was coming from but he was very good at telling us where his quotes were coming from and the precise page in the book it came from. Finally, and this might not be important to everyone, there wasn’t any homework or quizzes to help me check my understanding of the lectures. I really liked the course despite what I said above. I didn’t agree with some of what he said especially about the Tuatha De Dannan turning into the sidhe (it is not that simple) but for the most part his information is pretty sound. The subjects that Flanagan discussed were logical and grouped very well. They gave a good understanding of the Irish society and culture. I loved that he uses the Irish word for what he is discussing whenever possible. His sources for the quotes were a bit on the old side but they were sound for the subjects he was discussing. 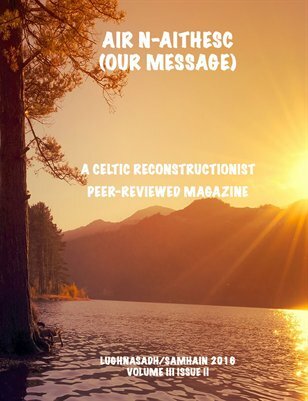 He has resources on each lesson that sometimes included articles off site or YouTube lectures by well known professors of Celtic studies along side his slides and wave files of the lectures themselves. Almost all of it is downloadable. Some of the subjects discussed in this course were the structure of Irish society, kings, warriors, women (I was very impressed with this subject as he gets it right), divisions of the land and the sacred sites, pagan religion, and burial rites. All in all I would recommend this course to people who are interested in a solid introduction to the ancient Irish culture and society, but as with everything…cross-reference, cross-reference, cross-reference. So it is out. Please let us know what you think!